The story Derege narrates, is at once a story of personal courage and conviction as well as the moral dilemma inherent in war. Fed up with the tyrannical ruler who continually ignored their informed and professional counsel to institute crucial policy changes to end the war in the North and the government’s refusal to seek political solution to the internal problems the country faced, three high-ranking officers decided to design a daring plot to overthrow the government. These officers were: Maj. Gen. Merid Negussie, the Chief of Staff, Maj. Gen. Fanta Belay, the Minister of Industry and former Commander of the Air force, and Maj. Gen. Demissie Bulto, the Commander of the more than 200,000 strong Second Revolutionary Army. They convinced many others to join them and attempted the May 89 coup d’etat against the brutal dictator who ruled Ethiopia for fifteen years. Like all good works of literature, the book has a quality of keeping one in suspense. It narrates the intricacies of the plot from many angles based on eyewitness accounts, interviews with key individuals who were involved in the coup attempt, and a 17 years of research from various published and unpublished sources including information obtained from the United states Department of State through the Freedom of Information Act. When the attempt organized at the capital city failed in the first day of the coup, Gen. Demissie continued the effort in Asmara, then Ethiopia’s second largest city. For three days, Gen. Demissie continued his call for the end of dictatorship and for the formation of a representative government. The EPLF agreed to a 15-day cease-fire and preparations were underway to send troops to the Capital to crush the Palace Guard that was protecting the dictator. It was a daring plan, but one with increasingly diminishing chance of success. Yet, Gen. Demissie chose to fight to the end instead of boarding one the many planes under his control at the Asmara Air force base and saving his life. At that critical hour, Derege intimately examines the intense challenges his father faced and the personal courage he displayed. 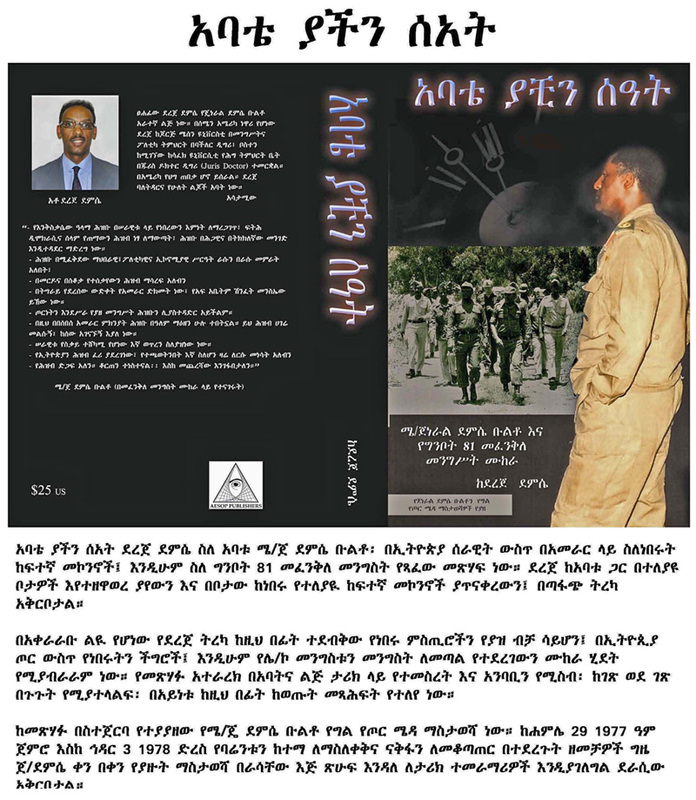 The book also contains a daily diary of Gen. Demissie Bulto taken during two of the most successful campaigns waged against the Eritrean People’s Liberation Front (EPLF) in then Northern Ethiopia. Zemecha Bahire Negash and Key Bahir Zemecha were often singled out for the sophistication of their planning and operation. Gen. Demissie, who was temporarily transferred from his position as head of the First Army in Harar, was assigned as the head of the Armed Forces Coordinating Committee that planned and executed the two campaigns. The daily notes the General took provide a detailed account of the coordination, planning, and the actual battles fought against EPLF forces that were entrenched in the town of Barentu and the mountains of Nakfa. The diary also includes details of the Key Bahir campaign, the last major effort to cease control of the EPLF headquarters at Nakfa. Gen. Demissie’s notes give rare insight into how the ground forces, the Airborne, the Navy, and the Air force collaborated in this campaign as well as the many logistical and structural challenges they faced. Abate Yachin Seat is a gem, a rare literary work that blends fidelity to accurate depiction of events with a writing style that captivates the reader like a superb novel. The book is a total of 431 pages. Hi, feel free to leave comments about the book for Derege Demissie or other visitors. Good job,i think it takes a lot to write the book along with other reponsibilities. to the deeds of a generation of great heroes. Bravo!!! I finished reading your book “Abate Yachin Se’at” at mid night last night. I just arrived at work late, because just like your nights after witnessing the misery in the war infested mountains of Eritrea, my mind wondered 21 years back and sleep was replaced with mixed feelings of sorrow, admiration, patriotism, and anger. For over two hours after I finished reading the book, I laid down on my bed staring at the wall trying to bring myself back from those cursed days of Ginbot 1981 to which you took me back through this powerful book. On Ginbot 8th 1981, I was in 1st grade class at Agazian Elementary School in Addis Ababa. I still remember the low flying helicopters and planes you described in your book and I now understand the significance of those days in Ethiopian history. The revolution against Emperor Haileselassie, the 1991 demise of the Dergue and the May, 2005 election are regarded as missed opportunities for Ethiopia to head in the right direction, however, the 1981 coup d’état attempt is one that would have conserved Ethiopian unity, one that would have made the clique that is currently in control of Ethiopia irrelevant, and it is one that may have had given Ethiopia the chance to head in the right direction. It should be now clear to everyone that when the coup failed, the only winner was the ethnocentric Stalinist clique that is now in control and still working to disintegrate Ethiopia. Whether the Eritrean leader admits it or not, it has become clear that neither the Ethiopian people nor the Eritreans benefited from how things turned out on Ginbot 8th 1981. However, the sacrifice of General Demissie Bulto and all other Ethiopian soldiers who gave their lives to defend our nation should always be honored. I sincerely thank you for doing that. I just wanted to let you know that our book club met on Monday evening to discuss on your book and wanted to send you our feedbacks. My Dad also joined us for the discussion and shared some of his personal story and helped us answer some questions. It was more personal for him since he knew most of the generals and it was a good blend having the book and him together. I have ccd everyone in here (the 5 of us from the book club), my dad and my sister and her fiance who volunteered to host the book club at their house so they can listen in to the discussion. Honestly, I wish you were among us that night. We all loved your book and I will let the others resonate their feedbacks. But I want to really thank you for writing this book. It was very educational for most of us who didn’t know the real stories of the coup. The book gave us a deeper understanding of the whole derg regime, the frustrations of the generals, the never ending war, their inability to implement their expertise, their reasons for the coup and sadly the failure of their attempt. It’s a question to all of us “what would Ethiopia be like if the coup was successful”? We wouldn’t have been living away, nor had this discussion in a foreign land. But it happened and here we are. However, thanks to books such as yours and people like you & my dad who knew them personally, who continue to educate and inspire us. These generals were true heros that sacrificed their lives for Ethiopia and for all of us. Their legacy will live on. Last but not least, I want to tell you that we were truly amazed by your style of writing, which was simple, straight to the point, but thought provoking. You didn’t try to sway the reader in any which way, you presented the real facts and allowed the reader to make his or her own opinion. You simply wrote what you saw from your own experiences, interviews and research findings without adding your own strong heart felt idea. We all know it wasn’t easy to do that, when in fact it’s more personal for & dear to your heart, and we thank you for that. On behalf of my book club, I want to thank you again for taking your time to write this book to educate and inspire many of us who were clueless. This is a book we can use for a reference for generation to come and the stories of these generals should always live on. I read Dereje’s book in one go. I cannot put it down once I started it. Dereje did a great job. His memory is encyclopidic.. The flow and lucidity of the story is fantastic.I found it buffling how somebody remembers such details. His father’s willingness to take his son to the most dangerous battle fronts is a testament to his love of his country. Despite the beauty of the story it was not easy read for me. I read it with guilt and anguish for I and my generation have lumped the then Ethiopian army as Derg and contributed actively or passively to its demise. At times, I was fighting tears when I read the selfless sacrifices the comanders and the rank and file paid for our beloved country. I think you guys’ effort to preseve the history is admirable and would be appreciated by present and future generation. It is also a nascent tool in fighting narrow nationalism and tribalism in all its forms. The tree of Ethiopian nationalism will never die but blossom for it is nourished by the blood our great compatriots of General Demisse’s caliber and selfless dedication. Our responsbility has to make sure the cause for which they die is restored. I salute Derege for a job well done. Congra… for a great book about a great Ethiopian hero. WOW, I have no words to express how i feel. its fantastic.I like the way you write the book, its simple, wonderful, educational. I’m sure your family is proud of you, and i too am proud that my country had a hero like your father and all the other Generals who tried the coup. it is simply amaizing ,i was so happy to read the story of our fathers deeds.thank u so much for giving us such a witness.i have a photo of your father with General Fanta Belay in diredawa.i dont know how can i show you. Spell god bless you all your family. SIMPLY EXCELLENT,ESPECIALLY 4 THIS GENERATION WHO DOESNT HAVE A HINT WHAT WAS THERE BEFORE THEY WERE BORN. u know what what a perfect book 4 the lost generation who only knows the story of EPRDF s golden lies,and considers the ethiopian army as dergs army.The real soldiers r lost now,know it. I also read the book in one go and i can only say one thing to Derege, ” THANK YOU SO MUCH” because you let the people of Ethiopia to know the real history of Ethiopian soldiers who died in the line of duty to protect the national interest of Ethiopia. You did a great job, Gen. Demssie should be proud of you. I couldn’t put down the book. Though we lost the war in Eritrea no doubt your father’s and his comrades action was decisive in shortening the agony, misery and death of our people in that senseless conflict. The greatest lesson from the book: a coward is one who is not ready to die for his conviction. It would have been great if your dad got out for his own and his family’s sake, but one day History will honour him for his heroic decision. This book is a great contribution to Ethiopia’s historical record and should be read by all who love their country. May God bless you and the soul of your father. what can i say,such a beautiful book.In a time like now where talking about past is like a taboo,here is a light for us which shows our fathers great deeds.A great general offcourse, proffesional, well mannered,above all a true hero who stands for truth.Please lets try to learn from the way how they love there country.Believe whatever time it takes truth will come out one day. unbelieveable that how the story of such a hero is hidden for such a long time while we sit here hearing the story of the so called tegadalays. Proud of your dad, Could you please add some captions under the lovely pictures so that people could understand which is which. I real admire the book which will help to clue for the next generation. 1981 coup d’état would have bring inspiration our nation and would have avert the current situation. I was reluctant to read this book for a while thinking it would be typical defensive of a son about a father. But it was a great book backed by facts and eye witnesses. Thank you for shedding the light about the 1981 coup. Above all, you told us a story about not only a great general, but also about a great Ethiopian and father. I wish we had (have) more Ethiopians like General Demissie Bulto. Thank you Dereje for bringing your father to life. Hi derje ,ante ye tarik ena ye hizb bale weleta neh ,congra..and mistak ale esum ,mengstu ke germen semeles ,ke radar bemesweru sayhon yameletew , aierhayloch teferartew syamenetu ,lyamelt chale enji ,liawerdut yechelu neber . Yehem ergetegna neger new , ena bezeh ystekakel. Betrefe gerum new . Dawet a.a.
Hi dereje meshafu gerum new ,abateh jegna endeneberu enkuan hizbu , mengstu dectaterum meskroal ,andand sewech post yadereguten semeleket ,enezeh dedeboch lek ende set ,syaqateru norwe hager endalaswesedu, ahun men qerachewna ahunem yaqatralu yasegnal , yasazenal,. Endezeh ayenet sewech enkuan ye hezb yahagerem telatoch selehonu begedelu ayaskonenem elalehu ,,derejem yemayrebu sewech asteyayet leyasazenh ayegebam ,,gen ye eth.andenet tegel mejemer yalebet keendezeh ayenet seytanochen kemasweged mehon alebe. Hi there! Just had to leave a note and say congratulations!! I am Michael’s mom (Lost in Ethiopia). We vitised him a few weeks ago and fell in love with the people and the country. If you long for pizza or Starbucks while in Addis, ask someone where Kaldi’s is located. You will feel like you are at home. I will watch your blog and enjoy hearing how it goes. Isn’t God good!